The U.S. Coast Guard says there are no signs so far that oil has spiiled from the site of an oil platform explosion Thursday in the Gulf of Mexico. The U.S. Coast Guard says there are no signs so far that oil has spilled from the site of an oil platform explosion Thursday in the Gulf of Mexico. Earlier, the coast guard had said the platform's owner, Mariner Energy, reported an oil slick about 1.8 kilometres long and 30 metres wide. But the company said in a statement that an initial flyover didn't reveal any spilled oil. The fire from the explosion has reportedly been put out. The explosion happened on a rig owned by Mariner Energy about 170 kilometres south of Vermilion Bay, La. ((CBC))The blast happened around 10:15 a.m. ET on the Vermilion Bloc 380 platform, Patrick Cassidy, a spokesman for Mariner Energy, told CNN. Mariner Energy deployed three firefighting vessels to the site to fight the blaze. Investigators are trying to determine what caused the explosion, which happened about 170 kilometres south of Vermilion Bay, La. Speaking from the state capital, Baton Rouge, Louisiana Gov. Bobby Jindal said it's too soon to know the extent of any pollution. "The company has told us that it's contained and nearly burned out [and the platform's seven wells] are shut in right now," Jindal told reporters. He added that the company said production at the shallow-water platform's seven wells "has been averaging 1,400 barrels [about 223,000 litres] a day, and in addition to that, 9.2 million cubic feet of natural gas a day." Mariner Energy is headquartered in Houston but has offices in Louisiana and Calgary. Thirteen crew members were on board the platform at the time of the explosion. Although one was injured, all 13 were accounted for almost immediately. They were rescued by the U.S. Coast Guard and were being transported to Terrebonne Parish, La. 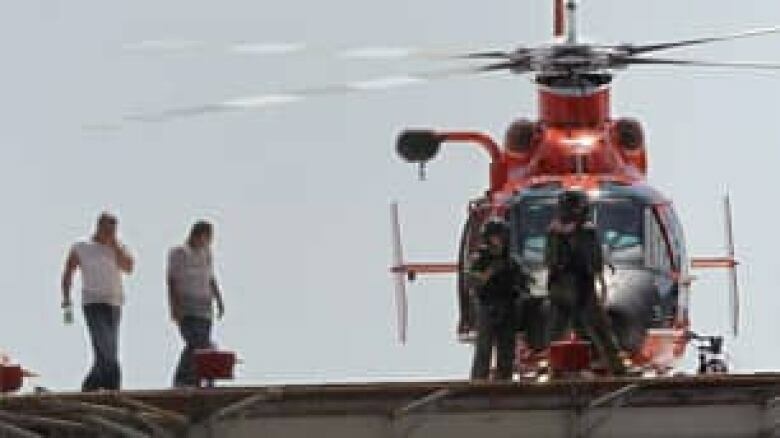 Two of the platform's crew members, left, walk away from a U.S. Coast Guard helicopter on the roof of Terrebonne General Medical Center in Houma, La., after they were rescued Thursday. ((Patrick Semansky/Associated Press))Eight rescue helicopters responded to the scene, four each from coast guard stations in New Orleans and Houston, said Petty Officer Bill Colclough. Three coast guard ships and four civilian vessels were also responding, Colclough said. The explosion comes 4½ months after the offshore drilling rig Deepwater Horizon exploded on April 20, killing 11 workers and setting off a massive spill in the Gulf of Mexico. Before the BP oil well could be capped, an estimated 4.9 million barrels or 780 million litres of oil gushed out into the ocean. In addition to more traditional oil assets on land, Mariner Energy owns numerous "high-impact, high-risk exploration in the deepwater" offshore assets, according to its most recent annual report. 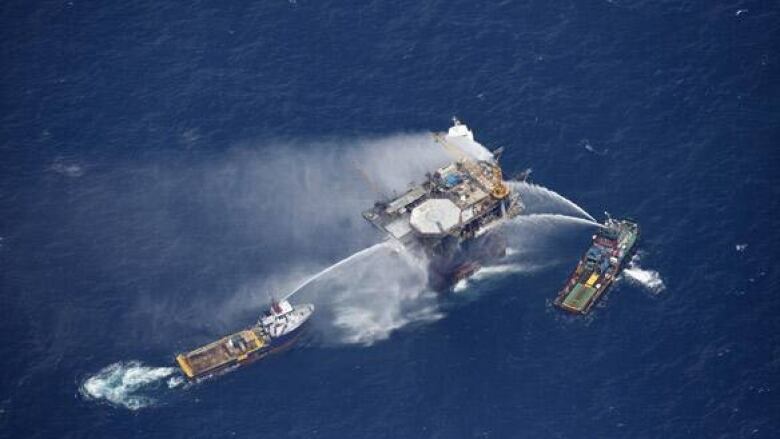 The platform that exploded was in waters with depths of about 98 metres, which is not considered deepwater. 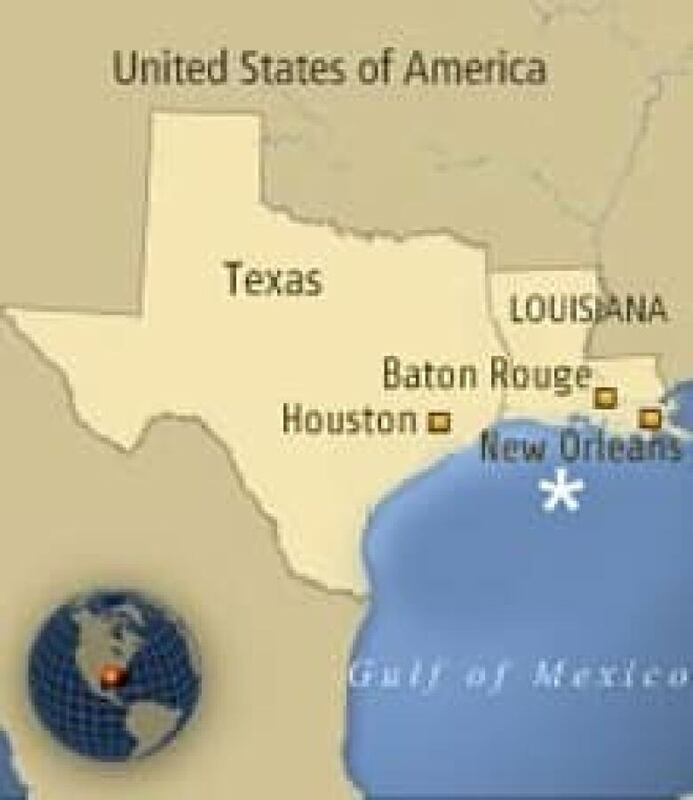 At the end of 2009, the company had interests in nearly 350 offshore leases in the Gulf of Mexico, with more than 110 of those in development. The NYSE-listed company had $1.3 billion US in revenues last year.